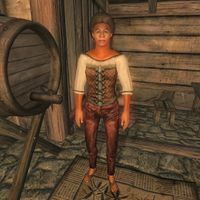 If asked about Rufio while on the Dark Brotherhood initiation test, she will provide a little information on him: "Not a lot to tell. He doesn't much like company, and spends most of his time in his room. Manheim thinks he's hiding out from someone." After the quest however, she will state that Manheim's thoughts were true: "Rufio is dead. He was murdered. It looks like he was hiding out from somebody after all."